While team collaboration through communication evidently is essential for businesses, doing it securely is a necessity. Troop Messenger, therefore, offers you state-of-the-art security features that protect your data from cybercriminals. With the advance of numerous online frauds and security breaches, any online exchange of information calls for the security and privacy of the transmitted data, as any weakness in security could be disastrous for a business. 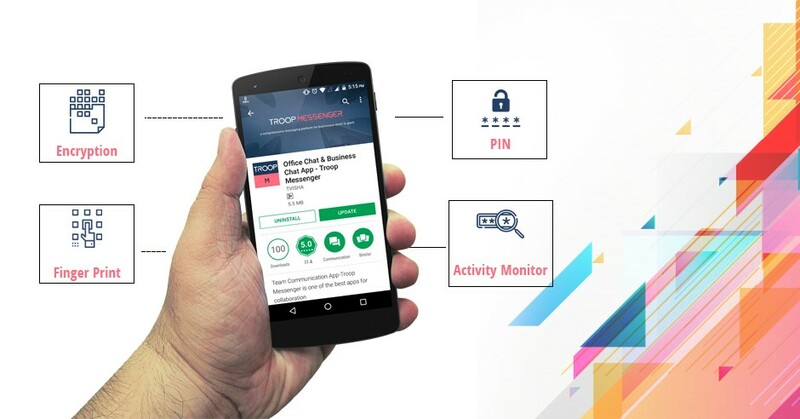 The new-age business chat app Troop Messenger uses Server-Side Encryption (SSE) to keep your data secure and confidential. The benefit of SSE is that along with maintaining the isolation of your data, it also limits the complexity of the environment. Troop Messenger gives you an option to save yourself from the trouble of signing-in on your mobile device with your user ID and password every time. It lets you sign in using a 4-digit personal identification number (PIN). The PIN is not only easier to remember as compared to an alphanumeric password but is also a faster way to sign in. To enable it, you can go to your profile settings and select security and set your PIN. Troop Messenger is a one-of-a-kind team chat app that provides you the latest and secure ways to sign in on your mobile device. If you prefer to not use a PIN but a more secure and easier way to sign in to your mobile device, do that by using your fingerprint. To enable it, click on the menu option on the top left corner of your screen. Then go to Profile and select Security. If your device has a fingerprint scanner, it will show the corresponding option. Once you have selected the fingerprint option, keep your finger on the fingerprint sensor (on your mobile device) and click on “Confirm” when prompted. You can now use your fingerprint to access the app on your mobile device. Troop Messenger is certainly an innovator when it comes to security features and this can be realized by exploring its activity monitor. If you go to your profile settings and click on the tab labeled “Activity,” you can see all those devices that are currently signed in to Troop Messenger with your ID. You can log off from any suspicious devices by clicking on the icon that looks like a box with an arrow and you are logged out from that device. If you want to log out of all devices, just click on the tab and you’re done. Besides that, the activity monitor also lets you view your usage details such as the number of messages, images, videos, files, and space utilized. There are many more salient features that we will share with you in various articles. Until then, share your feedback about Troop Messenger with us.